Sawtooth Conference North Division champion Carey High School (7-1, 4-0 league) wraps up its eight-man football regular-season slate Thursday, Oct. 28 with a 3:30 p.m. game just down the road at Richfield. Having allowed just two touchdowns in their last three games, the Panthers are hoping to hold down Richfield (2-5, 1-3) and take a head of steam into their first-round State 1A Division 2 playoffs game. 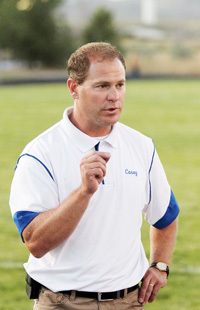 Coach Lane Kirkland said Carey plans to host that game Saturday, Nov. 6 at 1 p.m. at Derrick Parke Memorial Field. And the North top-seeded Panthers have found out their opponent—the Rockland Bulldogs. Visiting Castleford (8-0, 5-0 league, 54.9 ppg) stretched a 22-14 halftime lead into a 44-28 Sawtooth South Division victory over Rockland (7-1, 4-1 league) last Friday. The outcome relegated Rockland to the South second seed and gave the Bulldogs their playoff ticket to Carey. Led by the 200 yards-plus running of Cody Quinn against Rockland, the Castleford Wolves earned the South’s seed and will host their first-round playoff game against the winner of this week’s North Division second-place game between Mackay (4-3, 3-1) and host Dietrich (5-3, 3-1). Since the Sawtooth gets five playoff berths this year, the third-place teams in the North and the South will clash Monday, Nov. 1 in a 24-minute, one-half game at a neutral site. Murtaugh (5-3, 4-2) has already clinched the South third-place position and will play either Mackay or Dietrich. If Mackay loses at Dietrich and ends up third, the Miners and Murtaugh will play their loser-out game Monday, Nov. 1 at Carey. The winner of that abbreviated third-place playoff will travel to the Boise-area runner-up team in the first round. Note: Joe Laidlaw and Glen Andrews had 2-point safeties. Touchdown passes—Caleb Cenarrusa 6, Jordan Dilworth 3, Tim Hoopes 2. Conversion passes—Caleb Cenarrusa 11, Tim Hoopes 2, Jordan Dilworth 2. Notes—Carey has scored in 23 of 28 quarters....Carey has successfully made 26 of 47 conversions (55% success rate)....Carey has scored 49 TD—33 on runs from scrimmage, 11 on passes, 3 on defense, 2 on kickoff or punt returns.